China made a clean sweep of all the individual titles at stake to stamp their dominance in the SCG Badminton Asia Junior Championships which ended at the CPB Badminton and Sports Science Training Center in Bangkok on Sunday. Having retained the mixed team title for the fourth year running with a 3-1 win over South Korea in the final on Tuesday, it was China's show again in the individual events - sweeping of all the five individual events in the finals at the apart from retaining the mixed team event for the fourth year running. 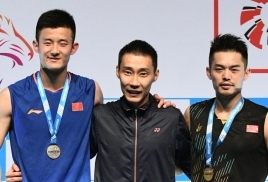 The men's and women's doubles finals were all-China affairs which added to China's gold tally. The Chinese had no difficulty in brushing aside the challenge of Taiwan in the men's singles and the Koreans in the mixed doubles. Mixed doubles pair He Jiting-Du Yue started China's "gold rush" although the top seeds were given a run for their money by South Korea's unseeded pair of Kim Won-ho-Lee Yu-rim and it had be decided over the full distance. The Chinese prevailed 21-12, 19-21, 21-19 in a 55 minute match which was interrupted several times by China coaches after their players were faulted for service. 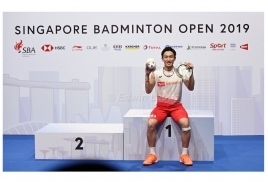 In the men's singles Sun Feixiang edged his Taiwanese opponent Lee Chia Hao with a 21-13, 21-15 win in 39 minutes. However, it was not an easy match for the eighth seeded Feixiang. The Taiwanese was seeded a rung lower at No 7. The women's singles also went China's way with third seed Chen Yufei taking the title with a 25-23, 21-14 win over Indonesia's fourth seed Gregoria Mariska in 46 minutes. After a hard fought first set Chen Yufei rode on Mariska's swollen right ankle to swing the match in her favour with an easier second set. "My swollen right ankle affected my movements on the court. I gave my all in the first set but the swelling became worse and restricted my movements. I could not put pressure on my right foot," said a disappointed Mariska, who picked up the injury in her semi-final match against China's Gao Fangjie on Saturday. "Still, I am happy to win the silver for myself and for my country." In the women's doubles third seeds Du Yue-Xu Ya defeated their unseeded compatriots Ni Bowen-Zhou Chaomin 21-15, 21-16 while in the last final of the day Han Chengkai-Zhou Haodong (No 3 seeds) upset top seeds He Jiting-Tan Qiang 21-12, 21-17 in an all-China men's doubles final in 25 minutes.